Amir Rawdat of NGINX, Inc.
We all know that performance is critical to a website’s success. No one wants to use a slow website. Since its initial open source release in 2004, NGINX has been synonymous with high‑performance websites. 66% of the world’s top 100,000 websites, and over 358 million sites worldwide are now powered by NGINX. But how well does NGINX actually perform? What hardware configurations will yield the best performance at a reasonable price? To answer these questions, we went into the lab and performance‑tested NGINX in two configurations: as a reverse proxy and as a web server. We published the reverse proxy performance numbers in our NGINX Plus Sizing Guide for Bare Metal Servers and detailed how the testing was done in our blog NGINX Plus Sizing Guide: How We Tested. Since publishing these pieces, we’ve received many requests for more specific information about the underlying testing results. So, in this blog post, we present detailed performance numbers for requests per second (RPS) and connections per second (CPS) on live HTTP and HTTPS connections. We also present HTTP throughput on 50 dedicated channels for NGINX running as a web server. The results apply to both the open source NGINX software and NGINX Plus. Our hope is that this information will help you decide what the hardware specs are that you need to handle current and future traffic for your web application, taking into account your budget and performance needs. The testing setup we used is almost identical to the setup in NGINX Plus Sizing Guide: How We Tested, except there is no reverse proxy between the client and the web server. All tests were done using two separate machines connected together with dual 40‑GbE links in a simple, flat Layer 2 network. To simulate different numbers of CPUs in the tests, we varied the number of NGINX worker processes. 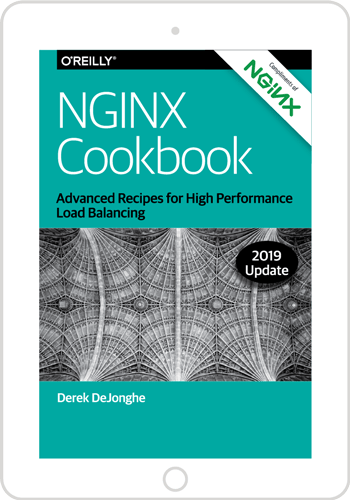 By default, the number of NGINX worker processes that start executing equates to the number of CPUs available in the machine where NGINX is running. You can change the number of NGINX worker processes executing by changing the value of the worker_processes directive in the /etc/nginx/nginx.conf file and restarting the NGINX service. Version 1.9.7 of the open source NGINX software ran on the web server machines. We installed it from the official repository at nginx.org according to these instructions. Ubuntu Linux 14.04.1 ran on both client and web server machines. We obtained the following performance numbers from the tests. For the commands used, see NGINX Plus Sizing Guide: How We Tested. Requests per second (RPS) measures the ability to process HTTP requests. Each request is sent from the client machine to the NGINX web server. The tests were done for both unencrypted HTTP and encrypted HTTPS traffic. 0 KB simulates an “empty” HTTP request or response with no accompanying data, such as a 302 error code. 10 KB approximates larger code files, larger icons, and small image files. 100 KB represents large code files and other larger files. Issuing small HTTP requests gives you more requests per second, with less total throughput. Issuing large HTTP requests gives you fewer requests per second and more throughput, as a single request initiates a large file transfer that takes an appreciable amount of time to complete. The table and graph below show the number of HTTP requests for varying numbers of CPUs and varying request sizes, in kilobytes (KB). Large HTTP requests (such as the 10 and 100 KB sizes in the test) are fragmented and take longer to process. As a result, the lines in the graph for larger requests have flatter slopes. HTTPS RPS is lower than HTTP RPS for the same provisioned bare‑metal hardware because the data encryption and decryption necessary to secure data transmitted between machines is computationally expensive. Nonetheless, continued advances in Intel architecture – resulting in servers with faster processors and better memory management – mean that the performance of software for CPU‑bound encryption tasks continually improves compared to dedicated hardware encryption devices. Though connections per second for HTTPS are roughly one‑quarter less than for HTTP at the 16‑CPU mark, “throwing hardware at the problem,” in the form of adding CPUs, is more effective than for HTTP – all the way up to 36 CPUs, for the more commonly used file sizes. Connections per second (CPS) measures the ability of NGINX to create new TCP connections back to clients that have made requests. Clients send a series of HTTP or HTTPS requests, each on a new connection. 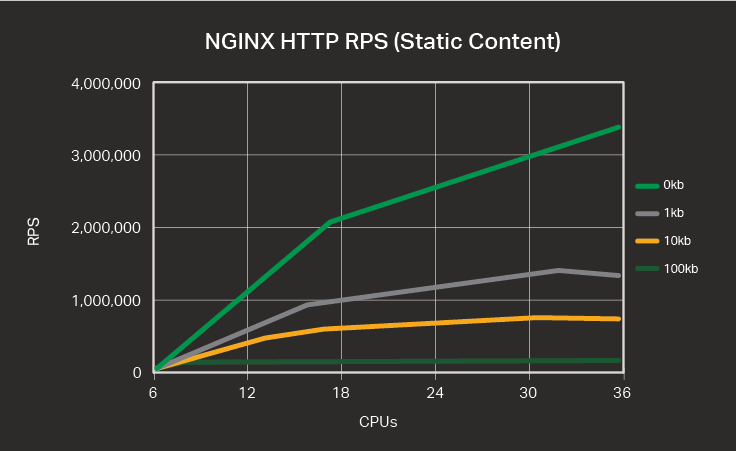 NGINX parses the requests and sends back a 0‑byte response for each request. The connection is closed after the request is satisfied. Note: The HTTPS variant of this test is often called SSL transactions per second (SSL TPS). The table and graph show connections per second (CPS) for HTTP requests across different numbers of CPUs. The graph resembles f(x) = √x, where x is the number of CPUs running. As for RPS, CPS growth flattens at around 16 CPUs, and there is a slight decrease in performance (here, in CPS) when we increase the number of CPUs from 32 to 36. 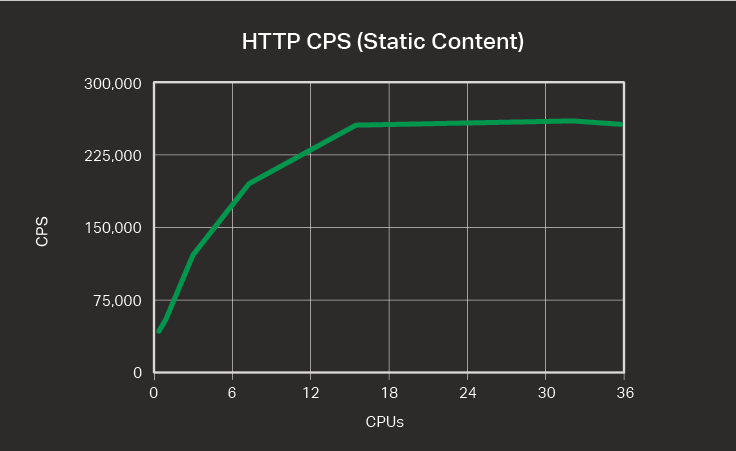 The table and graph show connections per second (CPS) for HTTPS requests. Because of timing constraints, we did not run the tests with 32 CPUs. We observe a higher rate of CPS increase the more we add CPUs. The graphic line flattens out at 24 CPUs. For SSL, throwing hardware at the problem works well. These tests measure the throughput of HTTP requests (in Gbps) that NGINX is able to sustain over a period of 180 seconds. The throughput is proportional to the size of HTTP requests issued by the client machine. NGINX gets higher throughput when the file size is larger, as a given request results in the transmission of more data. However, performance peaks at around 8 CPUs; more is not necessarily beneficial for throughput‑heavy tasks. 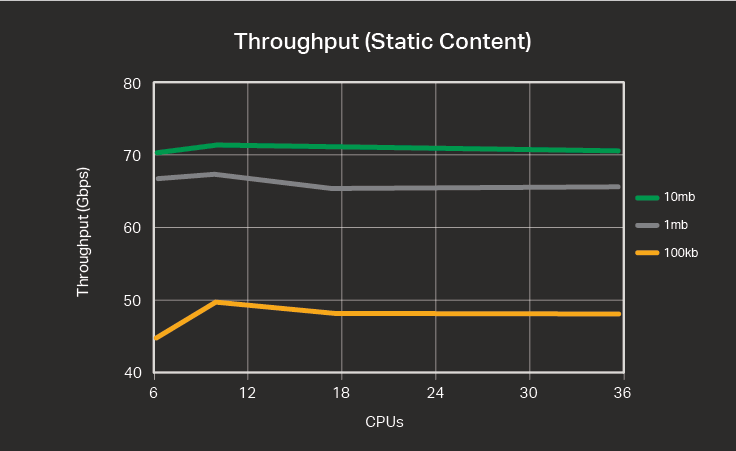 Hyper‑threading was available on the CPUs we tested, which means additional NGINX worker processes can run to use the full capacity of the hyper‑threading CPUs. We didn’t enable hyper‑threading for the tests reported here, but we did see improved performance with hyper‑threading in separate tests. 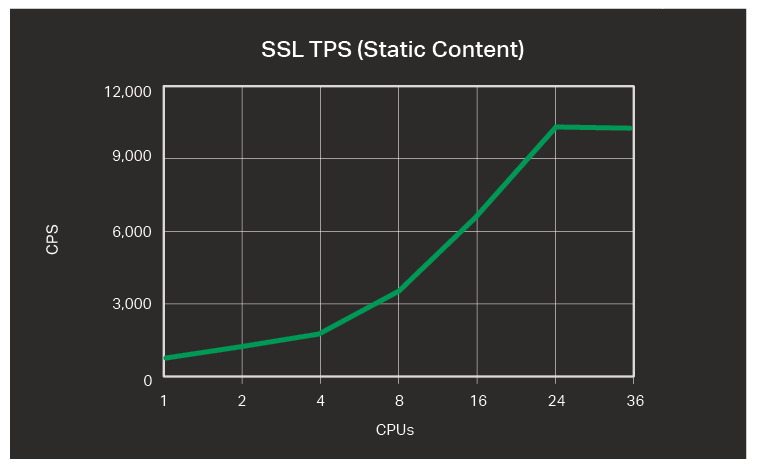 Most notably, hyper‑threading improved SSL TPS by about 50%. The numbers presented here are with OpenSSL 1.0.1. We also tested with OpenSSL 1.0.2 and saw about a 2x performance improvement. OpenSSL 1.0.1 is still far more widely used, but we recommend moving to OpenSSL 1.0.2, for better security as well as better performance. We also tested elliptic curve cryptography (ECC), but the results presented here use RSA. For encryption, RSA is still far more widely used than ECC, though ECC is often deployed for mobile, where efficiency in power consumption is necessary. We saw 2x to 3x performance improvement with ECC compared to standard RSA certificates, and we recommend you consider implementing ECC. The combination of moving to OpenSSL 1.0.2 and moving to ECC may bring very strong performance improvements. In addition, if you currently use 4‑CPU or 8‑CPU servers, and move to 16 CPUs – or even 32 CPUs, for SSL – as implied by our testing results presented here, you may be able to achieve a really dramatic improvement. We’ve analyzed performance test results for RPS and CPS on live HTTP and HTTPS connections, plus HTTP throughput on 50 dedicated channels. Use the information in this blog to help you decide what hardware specs you need to handle current and future traffic at your site given your budget and performance needs.